What could be more romantic for a golf lover than a trip to one of Italy’s most stunning design hotels hidden away in the Maremma region on the Monte Argentario peninsula and overlooking the Orbetello Lagoon bursting with pink flamingos to play some golf together? In addition to a round of golf per person over the picturesque Argentario golf course that winds through cork-oak woods and ancient olive groves, ‘That’s Amore’ includes a Valentine’s Welcome Surprise and the choice of a local Tuscan Tasting Dinner for two in the Resort’s stylish Dama Dama Restaurant prepared by the Resort’s chef, Emiliano Lombardelli, or a 50-minute couple’s massage in the Espace Wellness Centre and an automatic upgrade to a Junior Suite. Couples will also be able to enjoy the extensive 2,700m² MediSPA and its heated indoor pool, humid zone and gym as well as practise their golf on the driving range, play tennis and padel and venture out on the jogging paths on the Resort estate. To complete the package, a buffet breakfast, early and late check-out, garage parking and complimentary wi-fi are also offered. All this for just Euros 420 per couple per night whilst additional nights can be booked at a reduced rate. So why not sweep the golfer in your life off their feet and book Argentario’s ‘That’s Amore’ Valentine’s package any time between February 8 and 24 and if you stay on Valentine’s Day, February 14, you will be treated to an evening of Live Music and a Special Valentine’s Menu in the clubhouse. - To guarantee and confirm this booking, you will need to send your credit card information: type, number, expiry date and cardholder’s name. - Depending on low/high season, 30% or 50% of the total amount of the booking must be paid at check-in; while the balance will be cleared at check-out (cheques and bank transfers are not accepted as a form of payment during check-out). 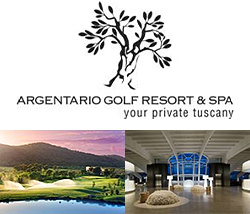 *Argentario was recently awarded 50th position in Golf World (UK) Magazine’s Top 100 Golf Resorts in Continental Europe 2018.